[CONT](RC):During your turn, if you have a vanguard with “Chronofang” in its card name, this unit gets [Power]+1000 for each card in your bind zone. 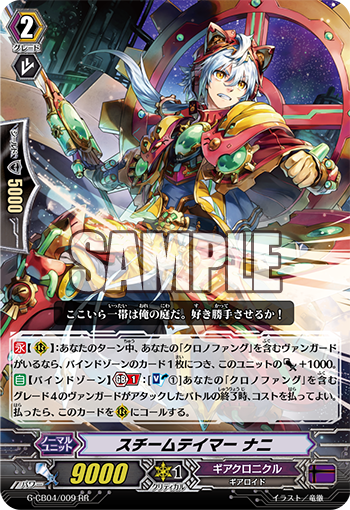 [AUTO](Bind Zone) Generation Break 1:[Soul Blast (1)] At the end of the battle that your grade 4 vanguard with “Chronofang” in its card name attacked a vanguard, you may pay the cost. If you do, call this card to (RC). Today’s card is a Grade 2 《Gear Chronicle》 Unit from the Clan Booster “Gears of Fate” (on sale September 30th, 2016), the Chronofang support card “Steam Tamer, Nani”! For each card in your Bind Zone, its Power increases by 1000, making it a Unit that can serve as an excellent attacker in its element! It’s a handy effect for 《Gear Chronicle》 who increases its Bind Zone due to 【Time Leap】. And this card’s main recommendation point, is that it can Call itself to the Rearguard from the Bind Zone. It’s an ability you can use in conjunction with “Chronofang Rebellion”. Because it activates when an attack ends, you can Bind “Steam Tamer, Nani” for the cost of Rebellion, allowing it to do its duty as an attacker! Because “Gears of Fate” includes multiple Chronofang support cards, make the Chronofang Deck you desire and Fight with it!